New President Xi Jinping has hailed the strength of China's ties with African nations. 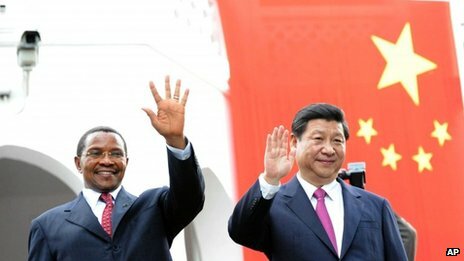 Mr Xi described Africa as "a continent of hope and promise". He was speaking in Tanzania - the second country he has visited since taking power 11 days ago. Addressing leaders at a conference hall built by China in Dar es Salaam, he said trade between China and Africa topped $200bn (£130bn) last year. Mr Xi and his Tanzanian countrpart Jakaya Kikwete signed 16 different trade agreements including improvements to Tanzania's hospitals and ports, and the building of a Chinese cultural centre.